Reading the short stories by Deepti Naval can be quite an exhilarating experience. In each story, one can feel the aesthetic sensibility that has helped her emerge as a multi-faceted artistic personality who can interpret and use each medium of expression to her advantage, be it acting, painting, photography or writing. There is a new world that opens up to the reader in every tale and at times, it becomes difficult for us to disengage ourselves and step out of that world. Long after the story is over, its landscape and characters stay in our mind and sometimes take on a life of their own. Sincerity, simplicity and sensitivity are the three most dominant strands that run through Deepti’s flowing narration. From the intense sadness and poignance of a fading life in ‘The Piano Tuner’ to the agony of a tragic childhood in ‘Sisters’; from the dark scenario of ‘Premonition’ to the nightmarish reality of ‘Thulli’, the author deftly weaves her stories, creating feelings including those of pity, joy, fear, sympathy, terror, admiration, hope and affection in our hearts. Deepti’s eye for detail is evident in each story, whether it has an urban or rural backdrop. The language is poetic and her romantic sensibility finds expression in many places in the stories. Her love for nature, for the mountains and rivers, flowers and the moon, the sky and the rain manifest itself in some way or the other in most of the stories. The fascinating Delhi winter, the Mumbai monsoon, the Ladakh blizzards, the mountain air (mentioned in many a story), the cool October breeze in New York, take us into a world which we have all experienced some time or the other. These are the soft nuances that give a painter’s and a photographer’s touch to the backdrop of the stories. The theme of seeking the unsought, going to places remote, exploring the external to discover the internal also runs through Deepti’s writing. Deepti is a keen traveller and this naturally becomes an important element in her fictional world. The nomad in her comes out quite often while writing. Vas in ‘Premonition’ is travelling, the protagonist in ‘Birds’ goes on a journey by air. Again, in ‘The Morning After’, Lily goes on a trip, by bus, to Ghuggar, ‘a deep valley surrounded by mountains on all sides.’ Mountain rest houses, simple hill folk, quaint villages in the hills of Himachal Pradesh and Ladakh recur in the book. While some stories in the collection are gentle and flowing, there are some like ‘Thulli’ that shake up the reader. The description of the encounter of the protagonist /author (sounds autobiographical) with the stark and ugly truths of life in the red light district successfully shocks readers out of their complacence. Some readers may find such descriptions unsavoury. ‘The Morning After’ brings to us a delicately told tale of a young widow who reaches a little village in a valley to meet a little boy who is the son of her late husband and another woman. Reaching there, she comes to know that the woman, Dolma, is now dead and the boy, Manu, lives with his maternal grandmother. The interaction between Lily and the boy has been very naturally captured in Deepti’s word pictures. In ‘The Mad Tibetan’ comes across an extremely stark and bizarre face of life. Set against the bare and chilling landscape of Ladakh, it brings to the fore a mysterious symbolism in the form of the old, mad, Tibetan man. The story which really stands out in this anthology is a true account, a beautiful page from Deepti’s own childhood. Titled ‘Balraj Sahni’, it takes us back to her childhood meeting with the great actor, who was a picture of dignity and grace, during a youth festival in Amritsar, her home town. Nine-year old Deepti, in a frock and two plaits, along with her father, with her little autograph book, waiting to have a word with the iconic Sahni is a picture that has remained in my mind. ‘The first star that shone on the screen of my real life was a tall, lanky, intense and very polished man called Balraj Sahni,’ writes the author. And it is in this recollection that Deepti gives us the key to all her art, her expression. ‘There are no straight answers. That is the beauty of life. I had learnt very early in my years to not look for straight answers. It is the ambiguity of things that enamours me, keeps me on my toes, or rather, in my boots. It is the un-known that fascinates me the most –the quest for what is yet to be discovered – that keeps drawing me back into living . . . and like I always say: To each, his un-known. The world knows her as a talented actor…. those who have kept tabs on her also are aware that she is a poet of considerable mettle. But the acclaimed actor as a story teller? Well, as she turned one with her first collection of short stories titled The Mad Tibetan, the result is as impacting as her tryst with celluloid. Intense yet simple, real yet incredible, understated and powerful, her worldview is simply breathtaking. Like one of her paintings that adorns the jacket of the book, it captures many subtle shades of life, its vicissitudes, twists and turns and takes you to the realm naked eye can’t quite see. In her debut anthology, words make love with images and acquire a life of their own and simply but surely she makes you a part of her characters. Characters that come from everyday life but with their human foibles and quirkiness these are as endearing as credible. Slice of reality it sure is yet touched by surrealism that is once again believable and enchanting. So in the story The Morning After she presents a wonderful psyche of human mind that not only learns to forgive and forget but finds a new way of life from the embers of a bitter past. Shades of Erich Segals’s Man, Woman and Child`85 well this one goes beyond and impresses with life’s ironies and dilemmas. In Bombay Central life reveals itself in its grey shades, beyond moral judgements and the beauty of the human bond, of love and emotion surfaces in ample measure. What is engaging about her stories is how simple human emotions not only tug at your heart-strings but triumph against all odds. In Birds, she word-paints the frenzy of birds having lost their off-spring with as much passion as the turmoil in the mind of the protagonist who has inadvertently sounded the death-knell of vulnerable creatures. Beautifully and dramatically, she contrasts the human pursuit for a better home with loss of abode of god’s other species. Same momentum of drama can be felt in the second story Sisters as well as in Premonition that Deepti acknowledges was motivated by a friend’s recall of his first love. Deepti’s felicity, however, lies in how she transforms it into an engaging account of a man pursuing a romantic interest at one level and warding off his fears of an accident at another. In a collection where several stories remain with you long after you have put away the book, the need to include part-memoir part-stories might be debatable. Indeed, in many a story Deepti the actor emerges as a character herself. In recounting these personal interfaces with life, Deepti succeeds in many like The Mad Tibetan that clearly is a fallout of her journey as a photographer. Then Thulli has all the elements of story telling and leaves you astounded as well as awestruck with a chilling yet humane peep into the world of prostitutes. Trespassing in the red-light area, which Deepti once dared to venture into, to hone her reel role Thulli is riveting as well as profound. In the sleazy world of flesh trade, human spirit remains indomitable and forms the crux of the storyline. Deepti distils human complexities remarkably in this one. But the same can’t be said of the one revolving around her meeting with Balraj Sahni when she was a nine-year old girl. Nevertheless, the collection is not only immensely readable but insightful, allowing the reader to delve deep into the psychological inflections of human behaviour. Without a doubt, Deepti shows great promise as a raconteur. If Deepti Naval wasn’t an acclaimed actress, perhaps her first collection of short stories The Mad Tibetan: Stories from Then And Now, would have received more attention for its content than the book release function. A compilation of 11 pieces – a mix of fiction, autobiography and travel writing – it’s a deft tapestry of musings on the human condition. You may not marvel at the writer’s flourish with the English language – although simplicity of expression is in fact, a highly underrated virtue — but are likely to be disarmed by her keen observation of life and empathetic world-view which embraces loners, madmen, prostitutes, tortured childhoods and birds, all in equal measure of concern. An ageing, Parkinson’s-afflicted piano tuner in Mumbai, struggling to make ends meet and keep his notes together — even as they “scuttled across the room, corner to corner, through the ceiling, against the damp walls and back” — sets the introspective tone of the compilation while Ruth Mayberry the screenplay writer in New York who “spoke slowly… and with grace, the one thing she never let go of”, completes the circle of life. Perhaps the finest story in the book is Birds. It is also amongst the shortest. But none speaks of the cruelty of human life and an individual’s capacity for tenderness as passionately. Narrated in the first person, the story spans a few days when the protagonist is getting her house painted and instructs the workmen to ensure they let out the birds who have made a nest in the ceiling of her study before cementing the roof. She leaves town and returns to a spanking house, only to be woken up early the next morning to the sound of birds hitting against the glass panes of her study. It’s enough to unleash despair in the heart of the woman who, in her rush of sentimental panic, is even willing to smash the new ceiling to let out the poor fledglings who must surely be trapped underneath. Bunny and Ginny the little Sisters of Joginder Nagar are no less vulnerable than those trapped birds. Their alcoholic father has dragged them to the local barber to shave off their heads to contain the spread of the lice that have caused abrasions on their scalps. The description of their silent revolt at the barber shop and the subsequent shame of “a few nicks and cuts at the self-esteem of two pretty little pahari girls” is horrifying. That, and the old woman of Falkland Road in Mumbai from Thulli, “her face painted a stale dead-white” sitting “on the edge of her caged world” are amongst the most poignant images in a book suffused with humanity. The book derives its title from a story about a man with “a clear disarming smile, like the tinny waters of the river” whom the protagonist encounters in the middle of nowhere on a trek to Ladakh. He dances and poses for her – “performing, peacock-like, strutting about, showing off all his colours; the flashing of his dark narrow eyes… his bewitching smile!” They call him ‘Nyonba’, the Tibetan word for ‘mad’. There is an element of insanity in everyday life too. As young Jatin discovers in Bombay Central when a stranger gives him refuge in his house on his first night in Mumbai and the lad lands himself in a bizarre situation that educates him on the intricacies of relationships. The only false note is The Morning After — too simplistic and filmi in tenor, it mistakes melodrama for emotional depth as Lily’s trip to the house of a mysterious woman called Dolma leaves the reader unmoved. I’d trade this mush any day for the tale of a random encounter with a long-forgotten friend in D, far more enjoyable for its candour and the writer’s ability to pluck out the drama from ordinary events. Equally charming is her encounter with Balraj Sahni as a little girl seeking an autograph from her favourite movie star. The invisible thread that ties these diverse vignettes together is an acceptance of life with all its quirks and complexities, never discounting oddity as a vice. It is at once a celebration of and a lament on human existence, expressed most overtly in Premonition, a tale of love and longing, stolen glances, irrational fears and inexplicable loss, oscillating between the promise of life and the inevitability of death. Yes, in case you are wondering, it is the same Deepti Naval. Same as in, the actor (these days one doesn’t use the word actress) who has done over sixty movies. Naval has been published by Amaryllis, an imprint of Manjul Publishing, which will shortly bring out my novel When The Snow Melts. A few weeks ago, I had attended a book discussion event at the Crossword Book Store in Juhu where Deepti Naval discussed The Mad Tibetan – Stories From Then And Now with the even more famous actor Shabana Azmi and had picked up an autographed copy of the Mad Tibetan. Yes, I knew that Naval has many talents, that she can paint, write and take pretty photographs, but reading is believing and until I finished the first of the eleven short stories that make up this collection, I didn’t really believe an actor could also write. Proof of the pudding is always in the eating, right? The Mad Tibetan collection reminded me of a dandelion seed, with each story like those small seeds with white whiskers, which when you blow at them, float in the air for a few tantalising minutes, capturing a few fleeting, precious moments, before they are lost forever. What I liked most about The Mad Tibetan collection was the way it dealt with relationships between men and women. There is mutual attraction, there is tension and some of the feelings are one-sided, but the man is not always on top. Bombay Central is the perfect example of this – Jatin is young and new to Bombay and when the man who befriends him on the train offers him a place for the night, one doesn’t suspect much. Even Jatin’s first impressions on meeting the wife do not arouse one’s suspicions as to what will follow. However, Premonition makes no bones about Vas’s attraction for the woman on the bus. She’s a bit older than him, but she has noticed him and seems to like him. Vas’s premonition of what’s going to happen stays in the background and distracts one from Vas’s pursuit of the woman, which is described so well and doesn’t have an iota of the usual note of harassment. Tulli is a true story of how Naval made an expedition to a red light district in Mumbai to meet a real prostitute or two, before she played the role of a prostitute in a movie. It all goes off well, till Naval comes face to face with a dreaded pimp, one whoPagesm every woman in that brothel was scared of. The pimp is drunk and he mistakes Naval for a new girl in his keep. The two male friends who accompanied Naval are not at hand and Naval is in real trouble until Tulli, the madam she has been talking to, draws the pimp off Naval. Naval tells us that, ‘I stood at the door, unable to move, choked by the scenario before my eyes. The man, ferocious a while ago, was now crumbling in Thulli’s arms. I can never forget her face, the last that I saw of Thulli that night, as we looked at each other: one woman to another, our eyes glistening! I slowly turned towards the dark staircase, then looked back one last time, at Thulli’s world, stunned by the dichotomy…… the absurdity of equation in human bonds. Other than Tulli, at least two more of these tales are true stories from Naval’s life. Balraj Sahni shows a very young Naval all agog with admiration for the famous actor Balraj Sahni, desperate to get his autograph. Does she manage to do it? Please read this book to find out. D is an incident which could happen to any adult who runs into a school friend after a very long time. It could happen to me, it could happen to you, it could happen to anyone whose memory fails once in a while. Is Birds also a true story from Naval’s personal dairy? Possibly. The narration is from the heart and the narrator’s pain is contagious. Between Balraj Sahni and Birds, one gets to experience hope and happiness, admiration and anger, sorrow, disgust, irritation and helplessness. The acknowledgements page at the beginning of the book is enlightening as well as perplexing. So, Ruth Mayberry, the last story in the collection is an interpretation of the life of a dear friend. However, where exactly has Naval planted the bitter-sweet memory from a childhood in Himachal which her Naval’s friend Neeta Bakshi has shared with Naval? My money would be on Sisters, not just because it is set in Joginder Nagar, which I know is in Himachal Pradesh, but also because an aunt of mine once shared a bitter childhood memory with me. Once this aunt had returned home from boarding school for her summer vacations, her hair full of lice. My aunt’s aunt (who looked after my aunt since her parents lived overseas) had taken drastic measures and had her long tresses cut off immediately. Something similar happens in Sisters, but there’s a lot more to that story than the tonsuring of two lice-ridden heads. The Mad Tibetan which has lent its name to this collection is a story of a …….well, a mad Tibetan whom Naval encountered in Leh. Naval tells us that the mad Tibetan is a bitter old man who is fierce and wild, but when he smiles, he is a child. Like many other stories, the ending is neither happy nor sad. The reader gets to meet the mad Tibetan firsthand and it’s time to move on. Period. The Piano Tuner, the first story in this collection, is also a similar vignette, this time of an old man in Bombay who once played the piano, but now reduced by Parkinson’s, tunes pianos with unsteady fingers. Most of the stories just end with the promise of a new and uncertain day. This is especially true of The Morning After where one finds Lily making a trip to Ghuggar to meet Dolma who seems to have a bad reputation in town. Dolma is dead, but lives on through her son Manu. Lily seems to be total stranger to Dolma and her household, but when she leaves Ghuggar, Manu goes with her and fittingly so. Do please read this wonderful book to find out why Manu should do so. Actress Naval has joined the legion of Indian writers with her maiden collection of short stories. “The Mad Tibetan: Stories From Then And Now”, which was launched in Mumbai by actor Amitabh Bachchan, will be released in the capital by director Muzaffar Ali Nov 12. Naval made her debut with the movie, “Ek Bar Phir” in 1979 and featured in a string of hits like “Chashme Buddoor”, “Kamla”, “Mirch Masala”, “Ankahi”, “Main Zinda Hoon” and “Panchvati”. A multi-faceted persona, Naval is a photographer, painter, poet and women’s rights activist. She manages a trust for the education of the girl child. Naval says she owes the book to her parents. Her mother introduced her to the art of storytelling, filling her up with stories from Myanmar. Her father taught her to sit still and get it “write”. The writer says she began to work on the stories “one-and-a-half years ago”. In interviews to the media, Naval said she made note of incidents in the 1980s and she looked into the jottings for plots while building the narratives- virtually lifting them from her notebooks. The 11 stories in the anthology are vivid, poignant – rich in visual details and narratives. At the heart of the tales are human beings-> whose emotions, Naval captures with delicate sensitivity and honesty. The language is next door- lucid, simple and easy to relate to. In the story, “The Piano Tuner”, Naval pulls the reader into the cramped musical world of piano teacher Feroze Batliboy, a little girl and a silent admirer, while “Thulli” is the moving story of a professional comfort woman (prostitute) from Mumbai’s Kamathipura red light area. 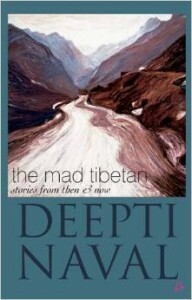 “The Mad Tibetan”, from which the volume gets its name, is set in Ladakh. Penned in first person, it is a slice of personal recollection. She captures through her camera the free spirit of the wild land through the dance of the Tibetan whom she met during one of her treks to the Himalayan kingdom. “The Tibetan lifts his arms, swings them around, turns, looks up at me again and begins to dance…Like a dervish he twirls, the exultant spirit, laughing, his flaming red robe flailing about him,” Naval writes. An avid traveller, Naval often takes off to the Himalayas with her camera and trekking shoes. The Oil painting of Leh on the cover has been done by Deepti Naval. ‘A short story is a high and difficult department of fiction because of the extreme concision required. …It tells something but it suggests more… What is wanted is a momentary impression of them artistically delivered’, says Ruskin Bond. And artistically delivered it is. This book is not dramatic, not a scream; but a soft spoken, rhythmic panoply of emotions with a subliminal character. Throughout the book, one is regularly awed by Ms. Naval’s observation of life’s nuances and of the human nature. Her sensitivity comes through, along with her concern – be it for a madman or a prostitute, a loner or even birds. That’s the thread which binds these totally different stories together. The common link is- the acceptance of life with all its simple complexities. The simplicity of language helps set the mood. The intention is not a vigorous shake but a friendly nudge. For me, the hustling between Sanjana and Ms. Naval (as mentioned in the acknowledgements) has been thoroughly successful. In ‘The Piano Tuner’ one can visualise the dilemma of the ageing protagonist affected with Parkinson’s trying to make ends meet on the one hand and to get his notes right on the other. Both the protagonists Feroze Batliboi and Ruth Mayberry are reclusive, dealing with rejections – personal and health related. Ms Naval’s delicate handling of the subtle shades here, compels one to start feeling anxious for them as the stories proceed. I found Dolma’s story ‘The Morning After’ quite predictable as also ‘Ruth Mayberry’ to some extent. Whereas ‘Birds’ is a passionate piece full of tenderness with glimpses of anger, sorrow, disgust, irritation and helplessness , ‘Balraj Sahani’ is a tribute to her first love – her God. It is a graceful, subtle and genuine piece like she and ‘her love’. – my two favourite pieces. A single alcoholic father, unable to bear the responsibility of bringing up his two tween daughters thoughtlessly compels them to tonsure their lice ridden heads. ‘Sisters’ is the story about their shame, humiliation and vulnerability. It is, at the same time a saddening and a horrifying tale. The turbulence going on in their minds is evident –their attempt to escape and conflictingly to stay put due to their longing for their mother. ‘Premonition’ is a tale of stolen glances and irrational fears interwoven with love and longing. And ‘D’ is a random occurrence experienced by most of us – a chance meeting with an almost forgotten friend and how frustrating it can get when one is unable to recollect her name. A sweet little story out of an entirely mundane event. A few paragraphs into ‘Bombay Central’ gave me an inkling of something untoward, even catastrophic about to happen to Jatin, but what followed was bizarre – quite a twist in the tale – her take on the intricacies of human behaviour. ‘The Mad Tibetan’ has great descriptions of nature and the landscapes of Leh. I am not even going to attempt to review this one and ‘Thulli’. Ms. Naval’s clever use of words makes her stories an interesting read – when she is ‘stunned by the dichotomy… the absurdity of the equation in human bonds’. The book is full of quotable quotes. ‘To each… his unknown…’ is my personal favourite. All in all, ‘The Mad Tibetan – stories from then and now’ is a deftly dealt, autobiographical-fiction sprinkled with travel writing. ‘The storyline was captivating. It was an emotional and expressive reading that kept me riveted to my chair. Your reclusive and love for nature and search for solitude is reflected in the story. So is the very perceptive understanding of life. The book is a superb collection of short stories that covers almost all aspects of human nature and relationships(men & women). Your choice of characters is rather unique – loners, madmen, recluses, failures. You have nonchalantly accepted all quirks and peculiarities as a part of life. Simultaneously you have dug deep into the human psyche to unearth and explore deep rooted emotions, feelings and insecurities. I have rarely seen such profound, accurate and stunning portrayal of human complexities. The stories cover a broad range of topics right from a tale of two young girls and their trauma as they face the ridicule of the whole town because they have to get their heads shaved, to and old piano tuner and his despair, as he battles loneliness and poverty in his twilight years. A story that I really liked was “D”. This is where the recollection of meeting an old friend who you recognize but whose name you are unable to remember. The anguish of not being able to put a name to the face is almost palpable. The most riveting story that I came across was of Thulli, where you recount your sojourn into Falkland road of Bombay in search of prostitutes so that you can study them for a movie role. It’s fabulously written and moves you beyond words. But for me the cut above the rest was “The Mad Tibetan” – Perhaps because for someone who likes her solitude and also likes to travel, one could relate the desire to live in Ladakh that too in the winter when the landscape is desolate but very peaceful. Your writing style is very distinct. I am tempted to describe it as austere and intense at the same time. The very striking and poignant characterization as well as expressive descriptions of situation and place paint images that are astoundingly vivid, realistic and leave you with a very strong almost visual impact. This book is not to be missed if anyone has passion for words !